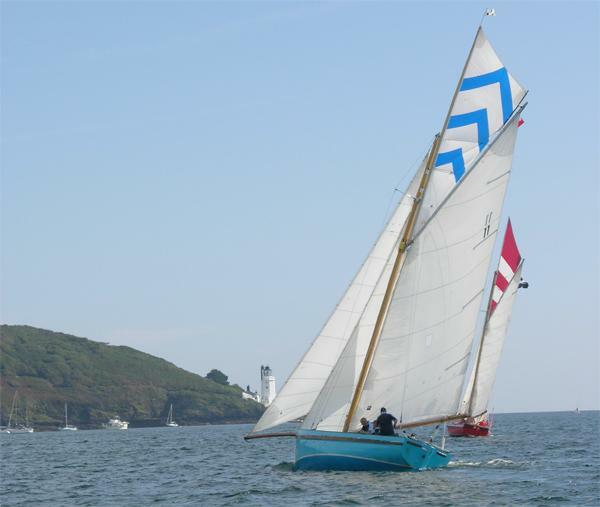 The Falmouth Working Boats have survived as a class because of the nature of the oyster fishing which has continued in the Roseland and in the river Fal for hundreds of years. The native oysters grow freely in the shallow waters of the upper reaches of the Carrick Roads from which they must be dredged under sail or oar. This restriction has had the effect of preserving the fishery although stocks are nowadays more prone to pollution and disease. Local fishermen have dredged for oysters using any craft suitable for the purpose and they believe the ideal dimensions are a waterline of some 24ft and a draft of no more than 4ft 6ins. The Working Boat fleet has therefore always been somewhat diverse with boats from all over the County being pressed into service. The key to the success of a particular boat was whether it was practical to work the beds under sail and be operated by one man, and what other tasks it could be used for in the summer months when the fishery was closed. When working in the winter the main controls for regulating the towing speed of the dredges is the scandalizing of both the mainsail and foresails of the gaff rig which all Working Boats carry. Obviously sail area is minimal, usually no more than 300 sq ft, and there is no need for any topsail. In the summer however, with the advent of the village regattas and Falmouth Week, the sail area is dramatically increased with a voluntary limit of 1000 sq ft.
Over the years Collars have supplied a number of masts and spars for these wonderful craft, each one rigged an set up by very experienced crews. With no engine and limited visibility under the yards of canvas, racing in close quarters is not for the faint hearted skipper.